Miles from the reach of the power-hungry upper class families, espionage plots, or Gotham City Police Department office interiors that have populated his well-known comics — thus far, anyway — Greg Rucka’s Veil is dark and really strange. The only dialogue in the first issue of the new Dark Horse series takes place between three people, and the utterances from its main character are minimal and usually the products of her repeating someone else. Veil, the mysterious doe-eyed protagonist after whom the book is named (or she at least borrows the name from a nearby neon sign), emerges naked from a closed subway station at the story’s onset. She’s lost, confused, and unable to communicate on her own. By the time we get to the final panels, however, Veil exhibits some deadly telekinetic powers. A seemingly “Good Samaritan” type named Dante whisks Veil away from a volatile situation in a sort of “red light district/1980s-era NYC Times Square” setting near the subway entrance of issue #1, and while she doesn’t have a clear handle on stringing words together in a sensible manner, she gains a better grasp on language in the second issue, where the mystery deepens and a bit of black magic is stirred in. Veil‘s slowly unfolding tale gets a glossy, spooky feel from artist Toni Fejzula, who also colors the book. Fejzula’s figures look as if they’re built of stained glass — cheekbones are made prominent by sharp-edged dark patches, and each of Veil‘s dewy, expressive faces, even those who stand mute in the background, glow to a degree that renders a bit dim the busy array of neon bulbs in the story’s opener. At the close of the first issue, a tense scene in front of Dante’s apartment gets a backdrop that mirrors mosaic art, as a set of fractured shards heighten the energy of the panel that has Veil mentally upending a situation that could’ve proven fatal for her when she compels gunmen to off themselves instead of her and Dante. All of these bright colors and playfully artificial human features, some of which remind me of the puffy-faced types that UK comics creator Hannah Berry paints, are a refreshing break from the norm on these bigger titles. 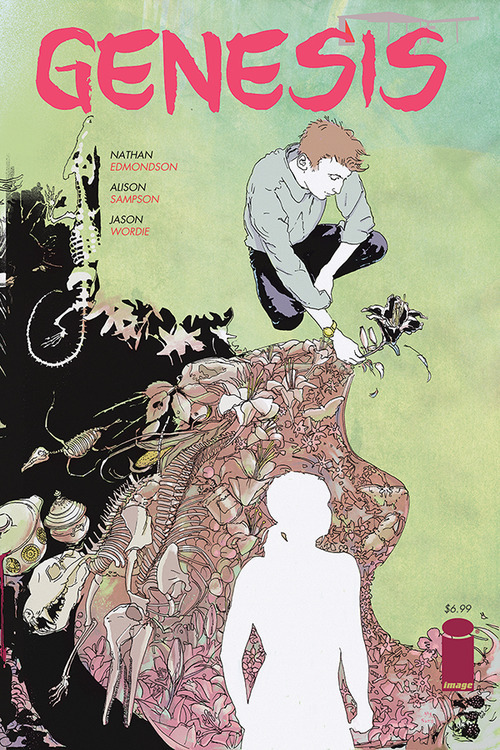 An all-powerful figure is also at the center of a new one-shot/graphic novella from Image called Genesis, which boasts psychedelic illustrations and a ponderous script. Writer Nathan Edmondson’s story of a miracle worker — on the cusp of what appears to be his 30s, a man suddenly finds himself capable of bending reality to his will, a power that proves incredibly difficult to manage — brims with horror and hallucinatory sci-fi elements. The art and general framework of the book is bold and fresh. 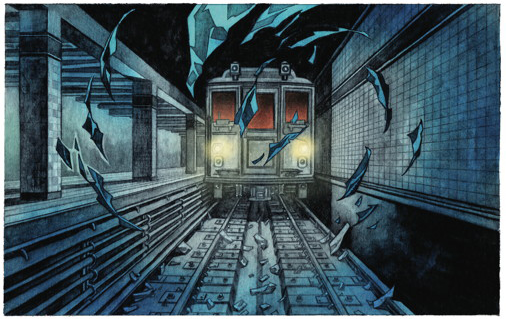 Action that might be anchoring one panel will occasionally spill over into another, or a subway platform will give way to a bottomless canyon, the ridges of which contorting and shifting to yield a skull-like facade when the perspective changes on the subsequent page. This all owes to UK-based artist Alison Sampson’s hybrid of fantasy and rather defined architectural design. 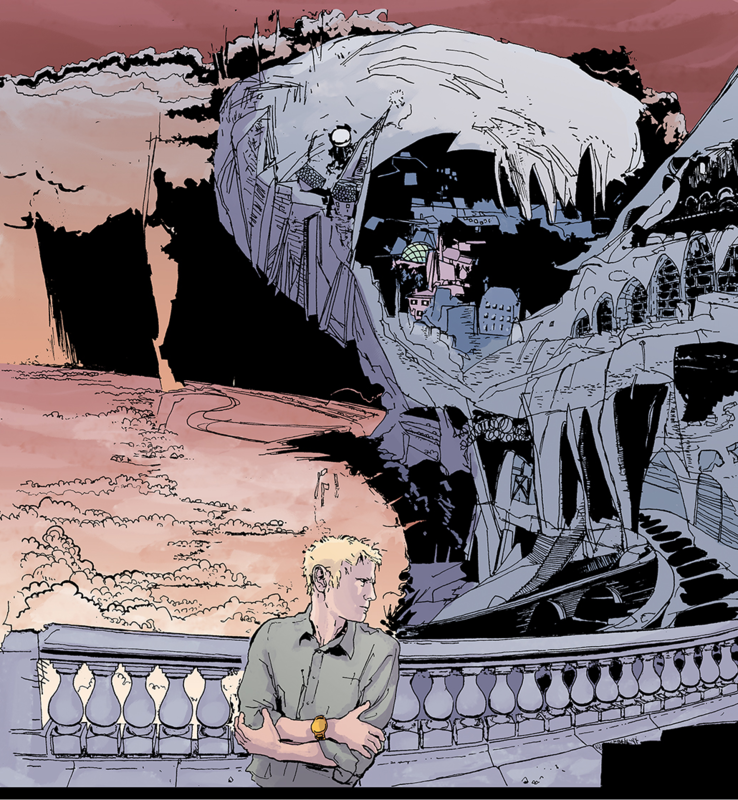 Sampson has a background in architecture (see a deep Robot 6 talk here about the art), and while the front end of Edmondson’s story calls for a more rigid, reality-based aesthetic, she has a lot of room to flesh-out the less tangible days that follow for Genesis‘s lead character. Alongside its nod to the all-powerful beings in classic superhero comics, particularly those in origin stories coming to grips with their abilities, there is a strong Biblical undercurrent to Genesis. Edmondson’s script follows a man called Adam, who is essentially a creator “blessed” with an ungovernable, unlimited power. The word “create” appears twice on the book’s first page, and before long, allusions to verses and parables follow, such as those that appear in the Book of Genesis, or of the Book of Mark’s “loaves and fishes” parable. 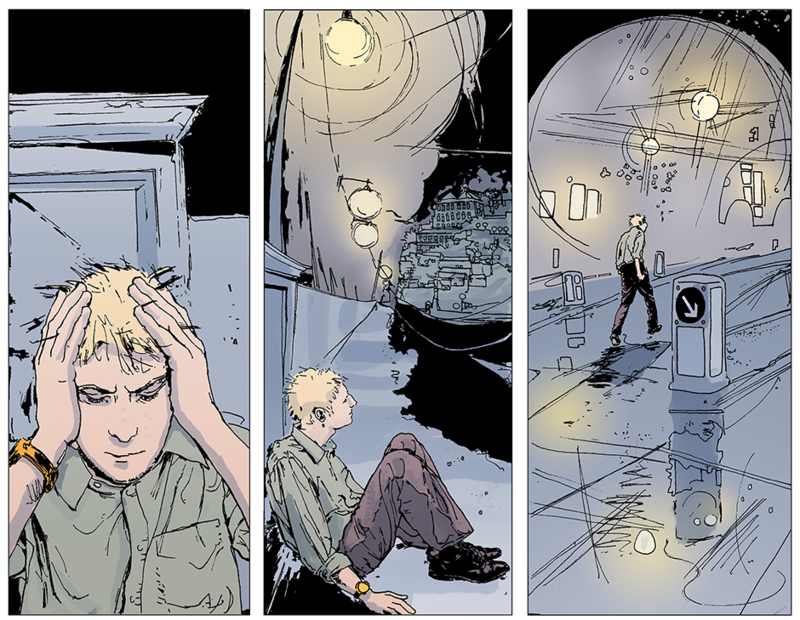 Sampson’s visuals get more complicated as the story evolves, and colorist Jason Wordie’s pastels and use of gradients look a bit like those in Daytripper, a Vertigo book that’s also steeped in themes of creation, life, and death. There’s a lot to see here — but don’t skim too quickly past the splash page that focuses on Adam’s childhood home. It’s tucked behind a gorgeous floral wall set off by the rich red tree branches from the street and Wordie’s pistachio green sky. Sampson is equally equipped to amplify space on these pages as she is to utilize it fully, filling-out the facades of small village homes in one panel with such rich detail that you can nearly see inside the windows. Before Adam returns to the house where he grew up, he watches from the road and seems to be taking a few minutes to gaze admiringly at Sampson’s intricate linework from below. Who can blame him? Veil images © 2014 Toni Fejzula. Genesis images © 2014 Alison Sampson.